Show stopping style perfect for an evening out! Pearls have expressed elegance throughout time. 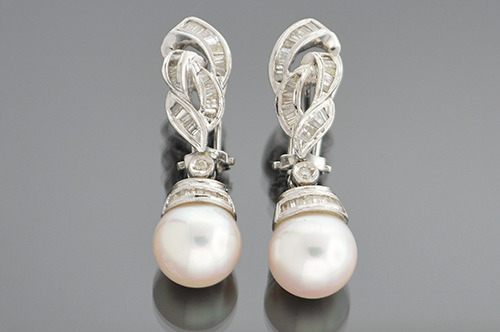 These earrings highlight large 10.6 millimeter white pearls with a slight pink tone. The pearls are accented by two round brilliant cut diamonds and 74 baguette cut diamonds that have a weight of approximately 1.00 carat total weight. These diamonds have an average color grade of I-J and an average clarity grade of SI(2)-I(1). Made of 18 karat white gold these earrings feature leaver backs that are easy to put on and close. This pair of earrings has an appraisal from the International Gemological Institute with a retail value of $4,510.